Ideal for dry, sensitive and mature skin types, the Vita Liberata Fabulous Illuminate Wash Off Body Bronzer delivers instant colour with a subtle shimmer and transfer-resistant finish. Infused with certified organic botanicals and developed with unique Moisture Lock™ technology for seventy-two hour hydration, its nourishing formula deeply moisturises skin, leaving you with a sheer, sun-kissed glow that can be washed off easily whenever you're ready. 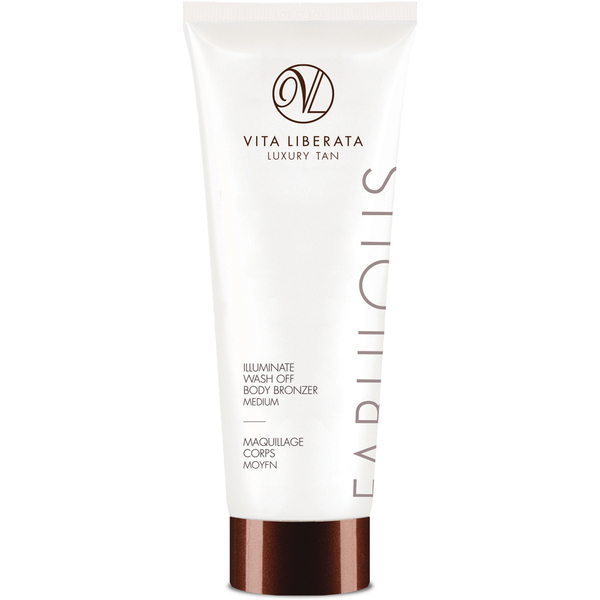 Apply to clean, exfoliated skin with a tanning mitt using long, circular movements. Use sparingly on hands, feet, knees and elbows. Aloe Barbadensis (Aloe Vera) Leaf Water*, Aqua (Water, Eau), Glycerin*, Cetearyl Alcohol, Cetyl Alcohol, Glyceryl Stearate, Dimethicone, Isohexadecane, Panthenol, Disodium EDTA, Butyrospermum Parkii (Shea) Butter (Beurre)*, Saccharide Isomerate*, Tocopheryl Acetate, Cucumis Melo (Melon) Fruit Extract*, Phenoxyethanol, Hyaluronic Acid, Vitis Vinifera (Grape) Seed Extract*, Ginkgo Biloba Leaf Extract*, Fucus Vesicolosus (Bladderwrack) Extract*, Litchi Chinensis (Lychee) Fruit Extract*, Rubus Idaeus (Raspberry) Seed Extract*, Hydrolysed Silk (Soie), Ethylhexylglycerine, Glycyrrhiza Glabra (Licorice) Extract*, Mica, CI 77891 (Titanium Dioxide), CI77491 (Iron Oxides), CI 17200 (Red 33), CI 42090 (Blue 1), CI 19140 (Yellow 5).